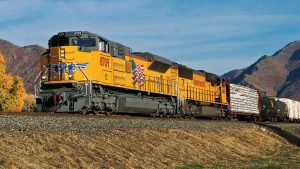 U.S. intermodal traffic realized gains of 5.7% and 6%, respectively, for the week ending Sept. 22, 2018 and 2018’s first 38 weeks, compared to the prior-year periods, the Association of American Railroads reported. 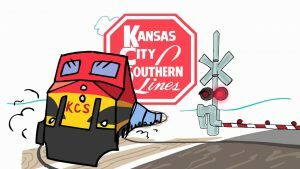 Total U.S. weekly rail traffic was 567,078 carloads and intermodal units, up 4.9% compared with the same week last year. Total carloads for the week were 272,615, up 4.2% from the same week in 2017, while U.S. weekly intermodal volume was 294,463 containers and trailers, up 5.7% compared to 2017. 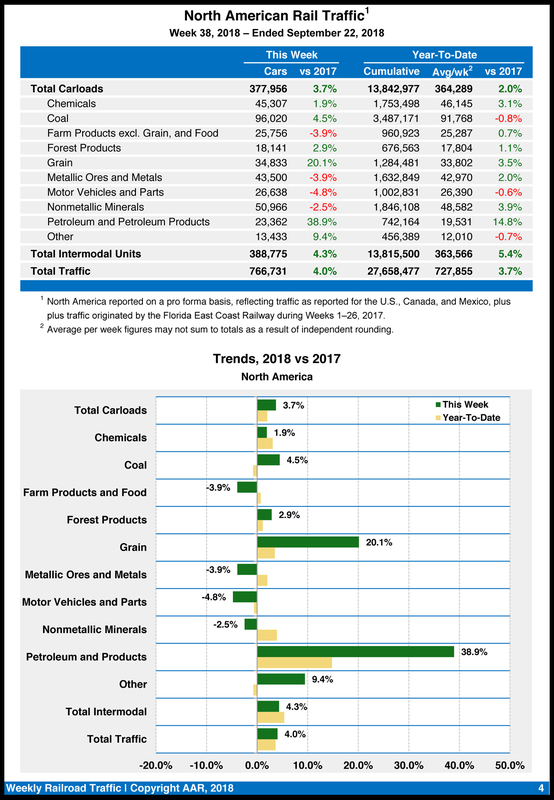 Seven of the 10 carload commodity groups posted an increase compared with the same week in 2017. 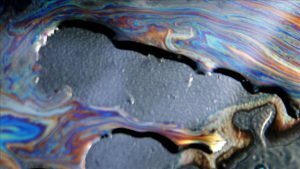 They included petroleum and petroleum products, up 3,934 carloads to 13,131; grain, up 3,689 carloads to 23,297; and coal, up 3,490 carloads to 87,890. 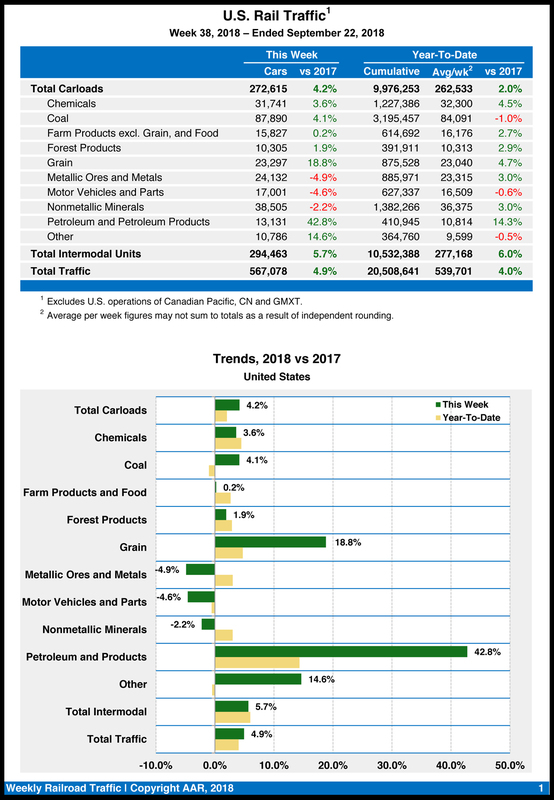 Commodity groups that posted decreases were metallic ores and metals, down 1,241 carloads to 24,132; nonmetallic minerals, down 882 carloads to 38,505; and motor vehicles and parts, down 822 carloads to 17,001. For the first 38 weeks of 2018, U.S. railroads reported cumulative volume of 9,976,253 carloads, up 2% from the same point last year; and 10,532,388 intermodal units, up 6% from last year. Total combined U.S. traffic for the first 38 weeks of 2018 was 20,508,641 carloads and intermodal units, an increase of 4% compared to last year. 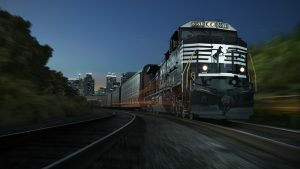 North American rail volume for the week on 12 reporting U.S., Canadian and Mexican railroads totaled 377,956 carloads, up 3.7% compared with the same week last year, and 388,775 intermodal units, up 4.3%. 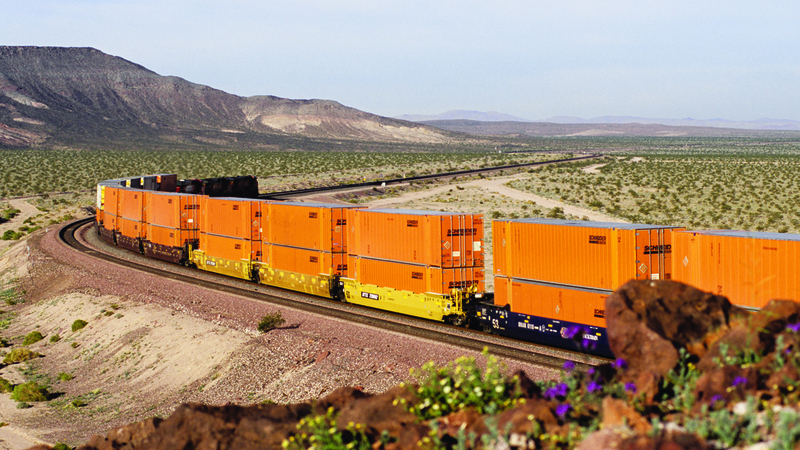 Total combined weekly rail traffic in North America was 766,731 carloads and intermodal units, up 4%. North American rail volume for the first 38 weeks of 2018 was 27,658,477 carloads and intermodal units, up 3.7% compared with 2017. Canadian railroads reported 84,859 carloads for the week, up 4.1%, and 75,455 intermodal units, up 3.4% compared with the same week in 2017. For the first 38 weeks of 2018, Canadian railroads reported cumulative rail traffic volume of 5,681,405 carloads, containers and trailers, up 3.8%. 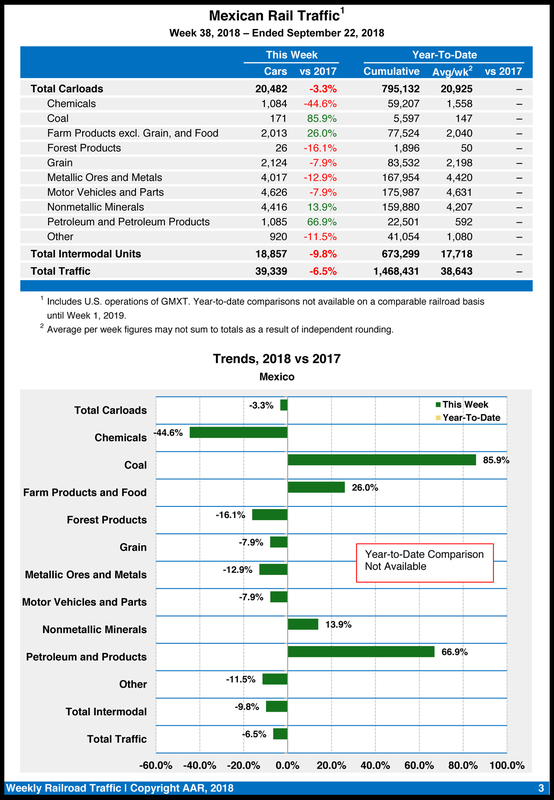 Mexican railroads reported 20,482 carloads for the week, down 3.3% compared with the same week last year, and 18,857 intermodal units, down 9.8%. Cumulative volume on Mexican railroads for the first 38 weeks of 2018 was 1,468,431 carloads and intermodal containers and trailers.